A North Texas woman is making it her mission to help dementia patients. 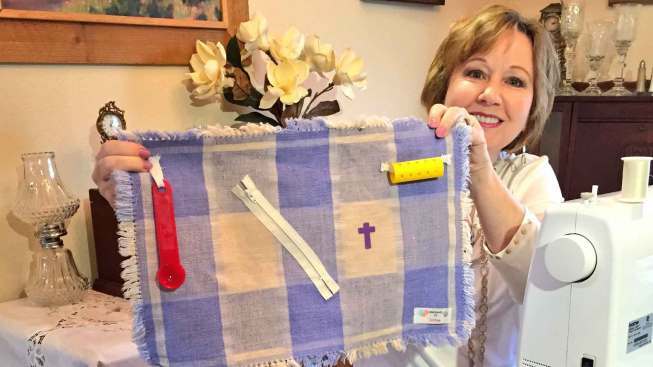 Li Cross of Granbury spends her days sewing fidget mats. She sews beads, zippers, pockets, key chains and other odds-and-ends onto place mats. The mats are designed to give Alzheimer's and dementia patients something simple to see and touch. "I want them to all have something they can touch and play with," said Cross. "And, if you know someone with dementia, often they don't even know what they're doing. Often it's a sense of touch and a memory might strike when they see it." It's an idea Li first heard about after her own father passed away from Alzheimer's. She watched his painful decline and after his passing learned how these mats can bring a bit of happiness during difficult times. She now makes these mats and gives them away for free to assisted living centers and health care providers around Granbury. Li said she has received thank yous from families of loved ones who received the mats saying their loved one spoke or smiled for the first time in a long time. "When I started getting the feedback from patient's families, that's when I realized this is my mission. I have to do this." Neighbors have donated money and supplies to help Li continue her mission. She hopes other people will donate their time and resources to make similar mats for their local senior centers.